While the subject of Afghanistan’s opium addiction has been the subject of much media attention, the fact that there is only one treatment centre specifically designed for women in the entire country has not. The Sanga Amaj Women’s Drug Treatment Center is based in Kabul, in the east of Afghanistan. Since it opened in 2007, the centre has seen over 850 women through its 45-day treatment programme. It is thought that the total number of people addicted to opium in the country is in excess of one million. Many of these are women and children, and the numbers are rising quickly. Given that it is the world’s biggest producer of heroin and opium, it is not surprising that drugs in Afghanistan are not only readily available but are much cheaper than medicine or food. In a country ransacked by poverty and war, children are reportedly given opium pellets to suppress hunger or to ease pain. Many children are born addicts due to their mother’s drug use during pregnancy. And it is not uncommon, according to a recent report by the Voluntary Association of Agriculture General Development, Health and Reconstruction Alliance, for women working in mining or stone crushing units to give opium to their babies to keep them quiet while they are working. 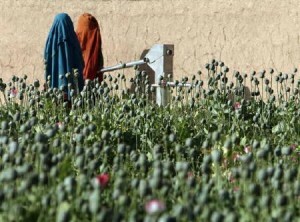 This is not the only way the country’s growing opium addiction is affecting Afghanistan’s women. Author Fariba Nawa described in her book, Opium Nation: Child Brides, Drug Lords and One Woman’s Journey, the tragic story of a young girl betrothed to a man over 30 years her senior to pay off her father’s opium debt (see WVoN story).